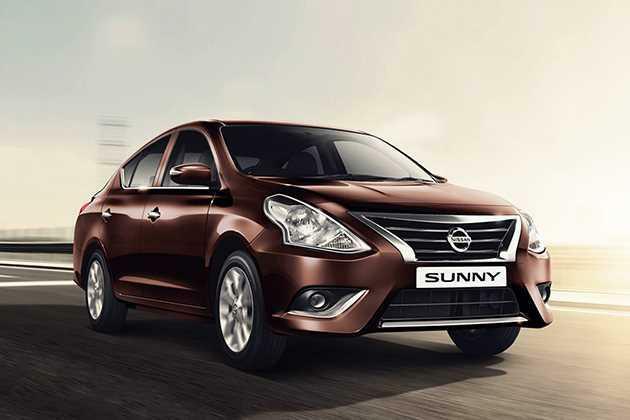 The Japanese automobile maker Nissan has launched the revamped version of its spacious sedan, Sunny in the Indian car market. The company made quite a few changes to its exterior and interiors as well, which gives it a captivating look. It is offered in three petrol and five diesel variants out of which, Nissan Sunny XL CVT is the automatic petrol variant. The company has blessed this trim with a 1.5-litre petrol engine that displaces 1498cc, which comes with an XTRONIC CVT transmission gear box. It has the ability to produce 99.61bhp in combination with 134Nm of peak torque output. This engine is incorporated with an electronic fuel injection supply system, which helps the motor to generate 17.97 Kmpl of peak mileage. This 2014 version gets a brand new radiator grille, slightly bigger headlight cluster and a revamped body colored bumper, which gives it an appealing look. This sedan comes with front ventilated disc and rear drum brakes, which delivers a reliable performance. Meanwhile, the front axle is assembled with McPherson strut, while the rear axle is fitted with torsion bar type of mechanism. The interior cabin is bestowed with a multi functional steering wheel, an advanced music system with Bluetooth connectivity, an automatic AC unit and several other such aspects. This top end variant is available in quite a few exterior paint options, which also include three new colors. The list includes Bronze Grey, Blade Silver, Pearl White, Deep Grey, Onyx Black and a radiant Nightshade. This sedan has a large body structure that is designed with a several refurbished features. The body colored bumper gets a new design and is incorporated with a wide air dam. The size of its radiator grille is slightly increased and it gets a thick chrome surround . The large windscreen is made of green tinted glass, which is further accompanied by a pair of wipers and washer. The overall look of the front is accentuated by the chrome plated company's logo fitted on to the grille. The side profile is neatly designed with body colored outside rear view mirrors and chrome door handles. The wheel arches are equipped with a set of 14 inch steel wheels, which are covered with 185/70 R14 sized tubeless tyres. On the other hand, the rear end comes fitted with a tail light cluster, which is incorporated with turn indicator and brake light. The large windshield comes with a defroster along with a third brake light. The boot lid is quite large, which is fitted with a chrome strip. The rear body colored bumper is now fitted with a muffler cutter that gives it an elegant look. This Nissan Sunny XL CVT is the top end variant in this model line up. Its comes with a refined internal cabin, which is done in premium greige color scheme and is loaded with a set of sophisticated features. Its insides has a re-designed center console, which is treated in glossy piano black scheme along with brushed metallic inserts. Furthermore, it comes with a revamped steering wheel, dashboard and other styling aspects, which gives it a decent look . It dual toned dashboard is equipped a big glove box, instrumental cluster, AC vents and a drive computer for the convenience of the occupants. The seats are very comfortable and they are covered with premium leather seating upholstery. This variant is bestowed with an electric power steering system, which is tilt adjustable and makes handling convenient. Apart from these, the company has installed aspects like a 12V accessory socket, all four power windows and numerous other such aspects. It also has utility based aspects like remote trunk and fuel lid opener, low fuel warning light, trunk light, passenger's side vanity mirror, adjustable head restraints and front and rear center armrests, bottle holders and several other aspects. It also has a multi-information display and a drive computer that has tachometer, an dual-trip meter, a digital clock and low fuel warning light. This trim is powered by a 1.5-litre petrol engine, which is integrated with 4-cylinders and 16-valves. This DOHC based power plant displaces 1498cc , which enables it to produce 99.61bhp of peak power at 6000rpm along with a maximum torque output of 134Nm at 4000rpm. The company has coupled this engine with a five speed CVT (continuously variable transmission) gear box that sends the engine power to its front wheels. This petrol mill is incorporated with an electronic fuel injection system, which helps in delivering an a healthy mileage. This sedan can achieve a top speed of about 175 Kmph, which is fairly decent. At the same time, it can break the 100 Kmph speed barrier from a standstill in just 15.8 seconds. It is blessed with a highly responsive electric power steering system, which provides precise response and supports a minimum turning radius of 5.3 meters. The braking mechanism is further enhanced by anti lock braking system along with brake assist and electronic brake force distribution. Its front wheels are paired with ventilated disc brakes, whereas the rear wheels get a set of highly reliable drum brakes. On the other hand, it comes with McPherson strut fitted to the front axle, while the rear axle has been fitted with a torsion bar type of suspension mechanism. This Nissan Sunny XL CVT variant is bestowed with a number of sophisticated features, which gives the occupants a plush feel while traveling. The list of features include follow me home headlamps, service interval reminder, trunk and map lamps, intelligent key with push button start, driver and passenger vanity mirror, rear comfort fan and reversing camera. The advanced air conditioning unit comes with automatic climate control and air filtration system . The 2-DIN music system is integrated with quite a few functions, which enhance the ambiance of entire cabin. This top end variant is bestowed with an advanced engine immobilizer, driver and front passenger airbag, door ajar warning notification on instrument panel, anti theft device with alarm and many other such aspects. Apart from these, it is also equipped with ABS along with EBD, brake assist system, central door locking, speed sensing auto door lock and keyless entry. 1. Modified exterior appearance with striking features. 2. Boot compartment is quite spacious. 1. Lower ground clearance is a big disadvantage.